Our mission: to provide our clients with innovative quality services. We are totally focused on helping organisations manage sustainability, by furnishing services and solutions that create economic, social and environmental value and benefit through innovation and knowledge, and taking stakeholder engagement as the basis for our actions. The following diagram shows how all our services are based on the premise of strengthening relationships between organisations and their stakeholders, as a key element in the advance to sustainability. The following diagram shows how the interrelationships among the different pillars leads to the attainment of management goals geared towards Sustainable Excellence. Through knowledge of what is implied by joint management of organisations&apos; financial and non-financial matters and their incorporation into the organisations&apos; strategy and management processes, value can be increased, not only from a purely financial point of view, but also from the standpoint of such organisation&apos;s intangibles. The processes of analysis and measurement of the achievements and impacts of strategies and processes implemented, and of any ongoing action plans, not only enable risk factors to be identified and managed, but also enable management to be steered towards continuous improvement. Through knowledge of what joint management of organisations&apos; financial and non-financial affairs, and measurement and follow-up of their corporate-designed strategy, management processes and activities can mean, negative impacts can be prevented and remedied, and maximum advantage can be taken of the value of positive impacts. identify, prevent and attenuate any possible adverse impacts. Lectures and talks, in-house workshops, classes, etc. Specialised courses in the AA1000APS, AA1000AS and AA1000SES Standards. Master&apos;s degree at the EOI and course on impact measurement. 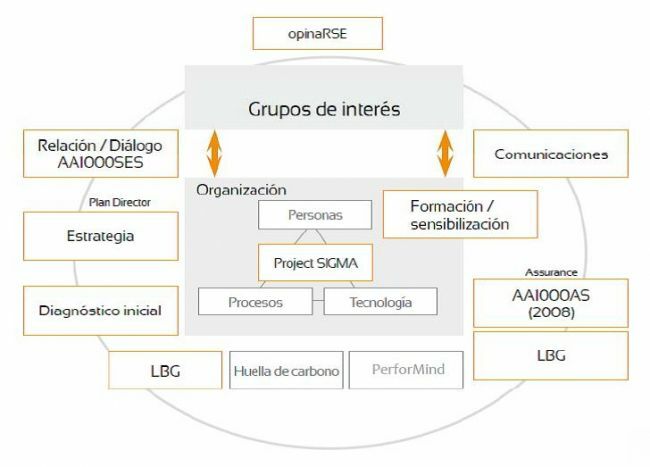 LBG and ONLBG methodology for measurement and evaluation of the impact of social action. Analysis of reports with reference to the AA1000 Standard and international best practices. Diagnoses and proposals for improvement of SR management systems, as well as systems integration. Specific processes: code of conduct, supplier management, management ethics, etc. External: AA1000, the Sigma Project, Measurement of Social Action (LBG and ONLBG). In-house: social action map, sustainability map, credibility measurement tool.